Whether it’s friends, clubs, or a major, finding your “thing” in college can be a daunting task. 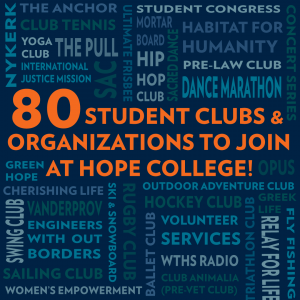 With about 80 different clubs and student groups at Hope College, you have plenty to choose from! Here are some tips that will hopefully help you determine what “thing” is right for you. Are you an athlete? You don’t have to be on a Hope varsity team to play sports here; there are many intramural options. Maybe trying to make the world a better place is more your style? There are community service organizations on campus that can help you do your part for the world. It doesn’t have to be something you did in high school or something you’ve tried before. It could be something you’ve never even heard of before, like this thing we have called “The Pull.” You think you know what a tug-of-war is? Think again. The Pull is a whole new level of tug-of-war, and one of the nation’s oldest standing college traditions! Try, try, and try again! There is no better time than college to step out of your comfort zone and try something new! Remember, if you try something and it isn’t working out for you, you don’t have to stick with it. Part of the college experience is exploring things you may not have had the opportunity to do before. Try it out and if you don’t like it, if it doesn’t fit in your schedule, or if it simply isn’t for you, don’t be afraid to step away from it. That’s okay. Currently, I am involved in YoungLife, Greek Life, Nykerk, and I have an on-campus job. But my “things” didn’t come right away. My freshman year I was involved in a handful of other activities like intramural sports, Habitat for Humanity and Ski & Snowboard Club. Do I play intramural badminton anymore? No, but it was a great experience to explore and I met some great friends! It’s important to figure out what fits best for you and your schedule. Hope has many resources to help you find your place. At the beginning of each year there is an Activities and Volunteer Fair. This is an exciting opportunity that allows you to explore all the organizations Hope College has to offer. 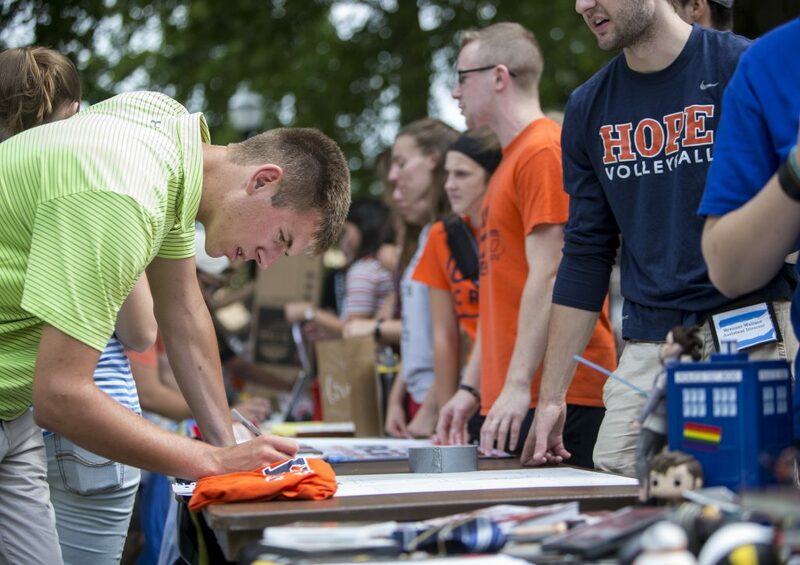 Hope College students hold their annual Activity Fair in the Pine Grove on Hope’s campus. The Student Activities Committee (commonly referred to as SAC) is an awesome organization on campus that plans fun student activities for everyone on campus. Stuck on which major to choose? Stop by the Boerigter Center for Calling and Career. They can help you identify your strengths and find which educational or occupational path may be right for you. And, don’t forget to check out this list of all the clubs and organizations Hope has to offer! Try not to worry about finding your “thing” right away! You may find the activity, club, major, etc. you love to do right away, but it may take a year or two. Take the time to explore different options and don’t be afraid to ask for help, I promise you will find your “thing” eventually!